An ad promoting the Israeli military’s acceptance of gay officers. (Image: blueStarPR)The openly gay mayor of Seattle, Ed Murray, recently repealed a boycott of Indiana he’d initiated over that state’s anti-LGBT legislation. From January through April 2015, Seattle city employees were barred from using any local funds to travel to Indiana, in a campaign also supported by the mayors of Oakland, Portland and San Francisco. Murray clearly believes in the power of boycotts. Now, some queer people want to see Murray apply the same rhetoric to Israel. This June, Murray headlines an LGBTQ conference in Tel Aviv, a conference that queer activists recognize as just another public relations play by Israel to appear progressive on gay issues, while obscuring the nation’s policy of apartheid against Palestinians. Forty miles south of the conference’s rainbow flags lies a cage made for human beings, fenced with 25-foot concrete walls. Noam Chomsky called Gaza “the world’s largest open-air prison.” Here, Palestinians, regardless of gender or sexuality, are forced to live in conditions that black South African politician Baleka Mbete described as “far worse than” those experienced by South Africans during apartheid. A term used by activists to describe an explicit strategy taken up in recent years by the government of Israel to portray Israel as a leader in gay rights and a gay tourism destination as a way to deflect attention away from the extreme violence of the Israeli occupation of Palestine. Through a campaign called “Brand Israel,” Israel has tried to change its public image, promoting itself as a “modern democracy” – and projecting a “LGBT-friendly” image is just one part of this. Pinkwashing Exposed: Seattle Fights Back is the story of a movement against double standards, where the struggles of queer and straight oppressed people intersect. Spade spoke with Truthout about the film, Israel’s backlash brigade and political deception. Toshio Meronek for Truthout: You went to Palestine in 2012 – what were some of the things you saw that really moved you to become active around the occupation? Dean Spade: I visited the West Bank as part of an LGBT Delegation; we were invited by several LGBT Palestinian organizations to come witness the conditions of the occupation and meet with Palestinians and Israelis who are working to stop the violence and oppose the use of pinkwashing to obscure it. The existence of this more conservative LGBT politics creates space for many public officials, not just the gay ones, to appear simultaneously “pro-gay” and aligned with very conservative politics. What I saw was utterly devastating. I visited a Palestinian village, Nabi Saleh, where the Israeli military uses tear gas and skunk water to harass families engaged in protest against the theft of their land and water every week and met a family whose son had been killed in December from a tear gas canister fired at his head. I sat in their living room and watched video footage of Israeli soldiers waking their children from bed at gunpoint in the middle of the night, arresting children and shooting gas canisters into their homes. I visited homes and villages where the apartheid wall is being constructed to separate Palestinians from their farmland, from their families, from their jobs, from health care and schools. I passed through checkpoints where Palestinians are humiliated every day trying to get to work or school or a hospital. I witnessed the apartheid road system, where Israeli settlers are allowed to drive on certain roads and Palestinians are barred. I saw the use of elaborate permit systems to enforce apartheid and imprison Palestinians. I walked the streets of Hebron, where a barricade separates the part of the sidewalk Palestinians are allowed to use and the rest of the road, which Israeli settlers may use. Plenty of queer people recognize how oppressions are linked: Here in the Bay Area, many of the people doing activism around Palestine are queer. Many of the organizers with Black Brunch and Black Lives Matter identify as queer. So where does someone like Ed Murray come from? While many people doing anti-colonial, anti-prison and anti-border work are queer and trans, I think the more visible LGBT politics these days is not one that is deeply invested in racial justice and decolonization. We see queer and trans politics as part of a broader political orientation that wants to end the brutal suffering caused by poverty, colonialism and racism. Over the last 40 years, a conservative gay politics has gained enormous ground in the US and has also attempted to influence queer politics globally. This politics is the one that says that we will be free when we can get married, join the military, become cops, and generally uphold the status quo even though we aren’t straight. That is not the vision that queer and trans activists, who I work with and am inspired by, hold. The existence of this more conservative LGBT politics creates space for many public officials, not just the gay ones, to appear simultaneously “pro-gay” and aligned with very conservative politics. A Bay Area example of this was when Gavin Newsom, as mayor of San Francisco, won national attention for his pro-gay marriage stance while he was implementing the city’s anti-poor Care Not Cash program. I see Ed Murray’s upcoming trip to Israel in the same vein as other elected officials who, while being gay or touting themselves as LGBT-friendly on certain limited issues, are still aligned with significant harmful agendas that hurt queer and trans people, people of color, people with disabilities, colonized people and poor people. An ad promoting the Israeli military’s acceptance of gay officers. (Image: blueStarPR) We see queer and trans politics as part of a broader political orientation that wants to end the brutal suffering caused by poverty, colonialism and racism. We know that queer and trans people who are in the most danger from violence, poverty and imprisonment will not benefit from a narrow inclusion politics that primarily benefits propertied people. We don’t want to fit into current systems that produce and maintain brutal maldistributions of land and wealth and get accepted and recognized by them; we want to dismantle those systems and build new ways of being, and we are part of movements that are doing that in all kinds of ways. That includes anti-pinkwashing work. Can you describe some real-world examples of pinkwashing, for people who have never heard the term? Common examples of pinkwashing include portraying Israel as an awesome gay tourism destination and funding films that portray Israel as a safe haven for gays and portray Palestinian culture as a homophobic culture that queer Palestinians need to be rescued from by Israel. Portraying other countries or populations as “more sexist” or “more homophobic” is a classic strategy of racism and orientalism. I should note that while the term “pinkwashing” is most commonly used to talk about Israel, we can see lots of countries engaging in the same strategy to cover up the realities of their violent regimes. The Obama administration has promoted itself as “gay-friendly” to make it look progressive while it has deported more people than any prior administration, persecuted government whistleblowers, kept Guantanamo Bay open, brought more troops to Afghanistan and generally failed on key progressive reforms that were hoped for by many voters. The end of “Don’t Ask, Don’t Tell” can be understood as a pinkwashing of the US military, whereby the military has been rebranded as a site of liberation and freedom for gays, when it’s actually a brutal force of harm globally and a racist, sexist, terrible workplace for people who are enlisted. Current surface-level efforts to hire gay cops or make jails and prisons “safe” for LGBT people can be seen in the same light – rather than getting our communities out of prison, they just shift the public image of institutions that are in crisis, using LGBT people as a topic that is supposed to flag reform and equality. One problem with these Consulate-sponsored events is that many well-meaning LGBT organizations jump on board to cosponsor, excited to support international dialogue on LGBT issues, without realizing that the events are state propaganda for a brutal colonial regime. 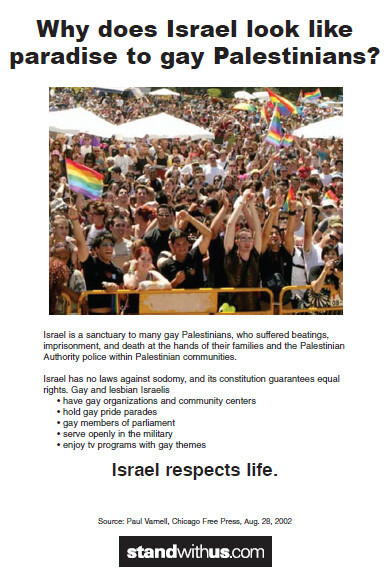 This is especially problematic because there is an ongoing boycott strategy, similar to the boycott of South Africa during apartheid, being utilized by activists all over the world to address racism and violence perpetrated by the Israeli government, and these events are a violation of that boycott, in addition to being a misuse of queer politics to advance propaganda. Pinkwashing is relevant to everyone because it is an example of the way that regimes currently maintain brutal, violent hierarchies under a cover of inclusion and equality. What I saw during my trip in 2012 helped me understand why Palestinians have called for a boycott of Israel, utilizing the strategy taken up against apartheid South Africa. Israel is so threatened by this strategy of worldwide solidarity against apartheid that it passed legislation in 2011 outlawing the boycott to intimidate people within Israel out of participating in the global movement. I understand why an enormous range of writers, speakers and artists, including important queer icons like Judith Butler, Alice Walker, Adrienne Rich and Angela Davis, have publicly supported the boycott and refused to participate in events in Israel. Some feedback I’ve gotten when pitching articles about pinkwashing is that it’s a subject that’s too “niche,” by which I assume editors mean that white, straight readers won’t be interested. Why is pinkwashing something that everyone should care about? Trailer: Pinkwashing Exposed: Seattle Fights Back! from Pinkwashing Exposed on Vimeo. Pinkwashing is relevant to everyone because it is an example of the way that regimes currently maintain brutal, violent hierarchies under a cover of inclusion and equality. Today’s methods of implementing colonialism, racism, and sexism are not solely the old-school, explicit apartheid versions (although that does exist in Israel, and de facto apartheid exists in the US in housing, school systems, health care and key public services). These days, the brutal methods of occupation and colonialism that governments like the US and Israel use – imprisoning dissidents, employing brutal racist policing methods, displacing indigenous people, etc. – operate alongside a rhetoric of multicultural inclusion. We’re told that marginalized groups are now protected by law from discrimination, that the courts, cops and the military are here to protect women and people of color. Our governments tell us the jails and prisons they want to build will specially protect women and LGBT people. Obama grants immigration relief to parents in the same breath that he promises to target criminalized immigrants with enhanced enforcement. This is an explicit strategy to maintain occupation and apartheid by embracing a liberal or progressive image where possible and bringing in the people that might be moved by the BDS movement. We all need to learn how to read state rhetoric that promises to promote our interests – uses our images and our struggles’ terminology – in order to preserve and expand the violence of racist, colonial regimes. Pinkwashing is one overt version of this politics that we can identify and resist in our work to build real transformation rather than celebrating when governments simply change the window-dressing in order to shut us up and keep justifying and expanding harm. How intentional a tactic is pinkwashing, as used by the pro-Israel lobby? The Reut Institute, a pro-Israel think tank, has produced research arguing that what Israel should do to improve its brand and prevail against the Boycott, Divestment and Sanctions (BDS) movement is to cultivate relationships with liberals and progressives on issues where Israel can connect with them. This is an explicit strategy to maintain occupation and apartheid by embracing a liberal or progressive image where possible and bringing in the people that might be moved by the BDS movement – people who oppose racism, colonialism and militarism – and “branding” Israel as progressive in their eyes using targeted issues. This kind of strategy is something we all need to understand so we can be more discerning readers, able to spot propaganda and seek deeper understanding. This strategy does not solely use gay politics in this way. Another example is how Israel has courted animal rights activists by portraying the Israeli military as vegan-friendly, allowing vegan soldiers to eat a vegan diet and wear non-leather boots. How far does this go – who is involved and what are some of the organizations that we should all be looking out for? In Seattle, we’ve learned to look for three main names on flyers and posters for events that are pinkwashing events: A Wider Bridge, StandWithUs and, of course, the Israeli Consulate. In 2012, it was these three players that were responsible for the “Rainbow Generations” tour of Israeli gay and lesbian activists to the Pacific Northwest. The corporate media drastically misrepresents the issues and our responses to them. Supporting independent journalism and making our own media is essential. StandWithUs is a right-wing Israeli advocacy organization that has strong ties to Christians United for Israel (CUFI). CUFI is infamous for the rampant homophobia of its founder, televangelist John Hagee, who made headlines when he said that Hurricane Katrina was God’s retribution for New Orlean’s Gay Pride celebration. StandWithUs partnered with A Wider Bridge, an organization focused on connecting LGBT people in North America with Israel. It aims to get LGBT invested in Israel by taking people on tours of Israel and bringing Israeli speakers to North America to talk about gay activism in Israel. A Wider Bridge is behind the big pinkwashing conference in Tel Aviv in June, with the gay mayor of Seattle, Ed Murray, headlining, and significant figures from gay organizations like Lambda Legal, the Point Foundation and the Williams Institute participating. Seattle activists are planning our response now. The Israeli Consulate funded the Rainbow Generations tour, and is often behind the pinkwashing propaganda that masquerades as intercultural exchange, but is actually about presenting a very particular view of Israel to drown out the realities of occupation and apartheid by associating Israel’s “brand” with the progressive issue of LGBT rights. On the topic of the Rainbow Generations tour, you received a lot of hate mail and death threats when you and other activists in Seattle called out the tour for what it was – pinkwashing. Some even wrote to your employer, trying to get you fired. Can you talk about some of the common silencing tactics the pro-Israel lobby uses when people try to expose Israeli apartheid? Hate mail and media targeting are common responses utilized by Zionists in backlashes against anyone who airs the truth about Israeli colonialism and apartheid. People who publicly question Israeli propaganda or disrupt the Zionist narrative often receive hate mail and death threats, attacks on social media, and media stories calling them anti-Semitic and/or misrepresenting their statements or activities. Sometimes they also experience people trying to get them fired or threatening them with frivolous lawsuits. There’s the recent case of Steven Salaita, a professor who lost his job because of tweets that were critical of Israel. Your documentary focuses on the BDS activism to protest events on that tour. You show how the mainstream Seattle media centered pro-Israel voices in the controversy. Was making this film sort of a response to that? As activists working to dismantle racism, militarism and heteropatriarchy know well, the corporate media drastically misrepresents the issues and our responses to them. Supporting independent journalism and making our own media is essential. I wanted to make a film about this 2012 controversy in Seattle because I know that many people are curious about what “pinkwashing” is but don’t know that much about it, and there were no existing films that helped break it down. This film is useful, I hope, because it tells a story of what some local activists did to speak truth back to propaganda, and how we made our city confront uncomfortable truths. It doesn’t spare the details of the backlash – and it was ugly – because being prepared for backlash is part of doing work against well-organized opposition. But I think it demonstrates that despite the backlash, our work built a great deal of awareness and relationships and strengthened our resistance network. Ideally what do you hope people who see the movie do after they leave a screening of the movie? I hope that people will screen this movie in their local activist groups and social circles (it will be available to watch free online) and use it in classes studying LGBT politics and social movements. I hope people will watch it when they realize that a pinkwashing tour or film is coming to their town and they want to get together with friends and think about responding. I hope people will study it when they want to think about what queer activism looks like that is non-funded, ad hoc, and based in community relationships. I am excited to screen it in Seattle, and I hope it will be a chance for us to keep on healing the wounds that the backlash created, especially between large LGBT and HIV organizations that participated in the backlash and alienated many community members by doing so. We still have a lot of work to do to hold the public official and organizations that got swept up in the backlash accountable and build more capacity in the queer and trans communities here to discern propaganda and stand strong against backlash. Pinkwashing Exposed: Seattle Fights Back premieres in Toronto on May 3; in Seattle on May 11; and in San Francisco as part of Outside the Frame: Queers for Palestine Film Festival on June 20.